Edited by Rachael Stoeltje, Vicki Shively, George Boston, Lars Gaustad, and Dietrich Schueller. Bloomington: Indiana University Press, 2017, 222p. The final published proceedings of the 2016 Joint Technical Symposium is now available for purchase through Amazon (http://tinyurl.com/ybeq852t) and through Indiana University Press (http://go.iu.edu/1DCy). 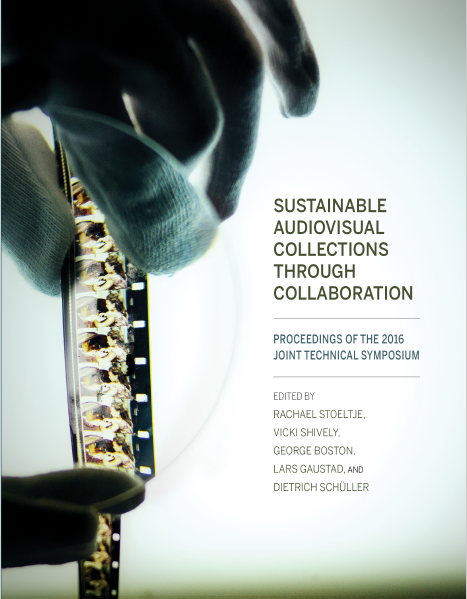 This publication is the result of the most recent Joint Technical Symposium (JTS) which was held in 2016 in Singapore, and addressed the theme, “Sustainable Audiovisual Collections Through Collaboration.” This ninth JTS was co-organized by the Southeast Asia-Pacific Audiovisual Archive Association (SEAPAVAA) and the National Archives of Singapore and as always, under the auspices of the Coordinating Council of Audiovisual Archives (CCAAA). The Joint Technical Symposium (JTS) has historically been an international scientific and technical event featuring presenters who focus on issues of particular importance to audiovisual archives and archivists. Organized every few years since 1983 by the various audiovisual archives associations now forming the CCAAA, it provides an opportunity for colleagues around the world and those interested in the field to meet and share information about the preservation of original image and sound materials.